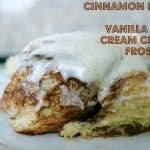 Cinnamon Rolls with Vanilla Bean Cream Cheese Frosting – a soft, sweet dough brushed with melted butter, sprinkled with a cinnamon/sugar mixture then rolled, sliced and baked. 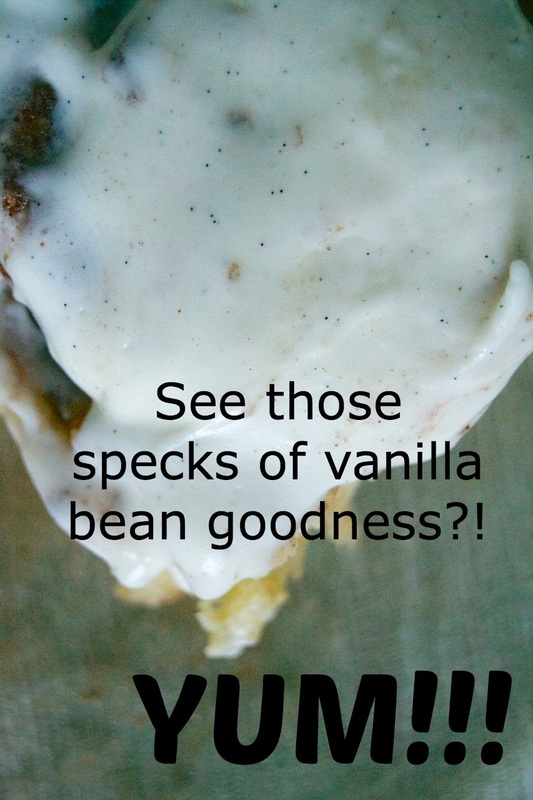 When removed from the oven, they are spread with a cream cheese frosting enhanced with the addition of a vanilla bean. I was given products for the making of this post but was not compensated. All opinions expressed are completely my own. Some mornings you just need some yummy gooey goodness to get you moving. Am I right? You KNOW what I’m talking about. 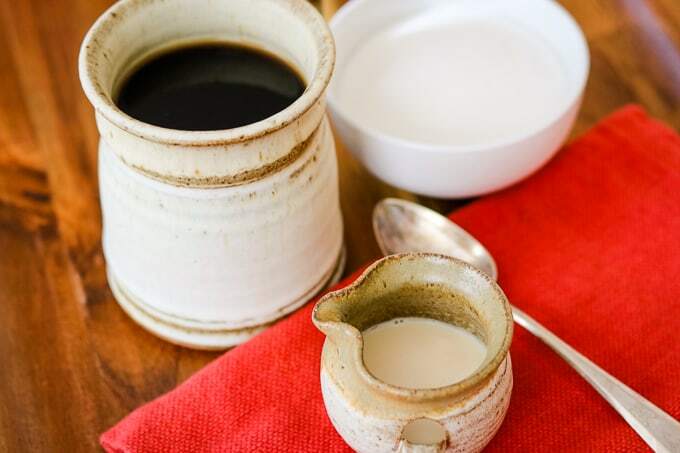 You’ve got that awesome cup of coffee in your favorite mug and made just the way you like it – black, extra light, or sweetened. 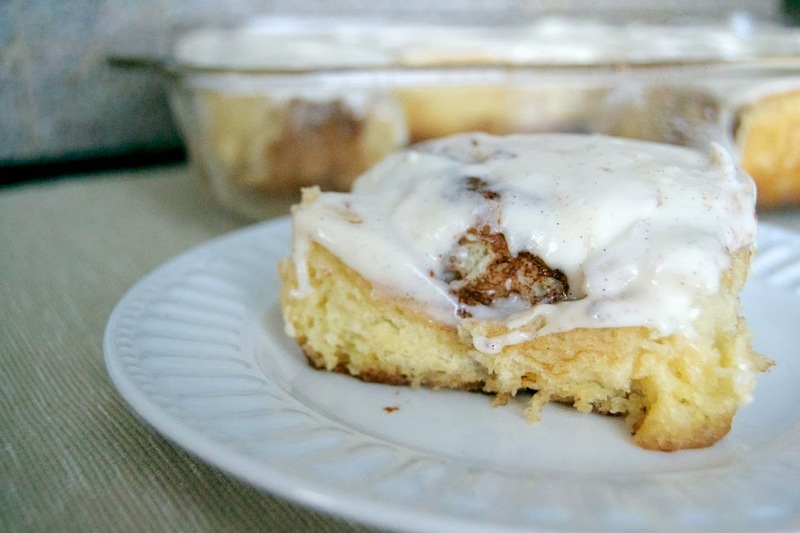 And to complete that picture of you snuggled on the couch under a blanket with either your phone or laptop or both, you have a large, warm cinnamon roll (or two) smothered with this awesome frosting on a plate next to you. Can you smell it? 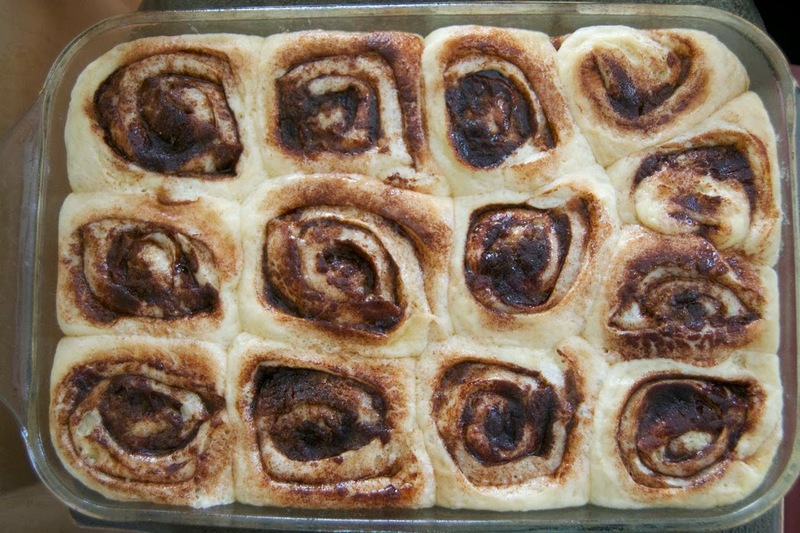 SAVE THESE CINNAMON ROLLS TO YOUR FAVORITE PINTEREST BOARD! Oh, I so need to be a part of this picture right now, swiping that cinnamon roll! I made two 9 X 13-inch dishes of these and no lie, they were gone in less than 36 hours. Yup. they were THAT good. The reason why they were that good is this…it’s the dough of all doughs for any cinnamon rolls I make from now on. I found the secret. I’m not gonna lie – they take some time to rise, and the recipe is wordy and looks quite involved, but they’ll be well worth it. It really is pretty easy. You’re just taking this dough, letting it rise, spreading it with buttah, sprinkling with cinnamon/sugar, rolling it up, cutting it into slices, spreading with more buttah, sprinkling with more cinnamon/sugar, letting it rise some more, baking and putting the finishing touch of frosting on. No problem. If I can do it, so can you. Seriously. 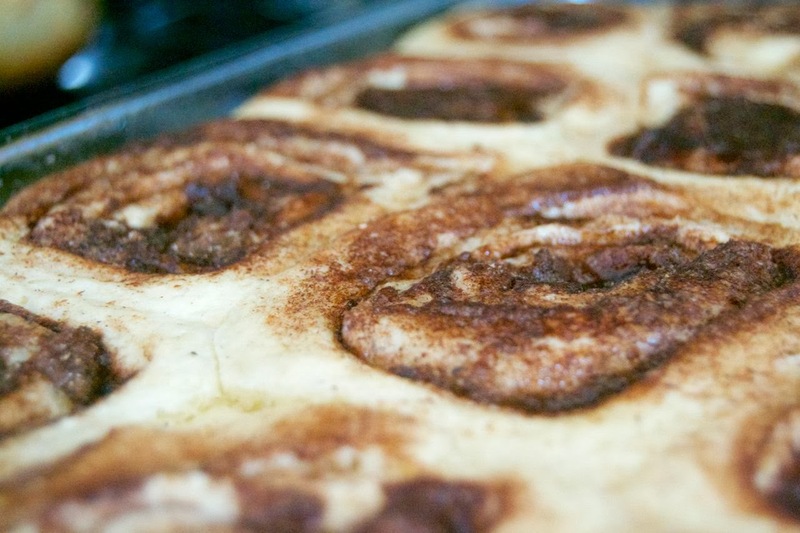 Here are some tips and tricks to make those Cinnamon Rolls the best EVAH! Next comes the good part. Paint that dough with half of the melted butter used in the filling. Make sure you save some for the rest of the dough! Paint it pretty and evenly. You don’t want to miss any spots! Then sprinkle half of that sugar/cinnamon mixture evenly around onto your butter painted dough. (You’re going to save the rest of it for the second batch of dough.) Gently roll the dough on the long side until all compact. Spread with the melted butter, sprinkle with more sugar/cinnamon and freshly grated nutmeg from the “topping”. Fill those nooks and crannies with that sugar/cinnamon. 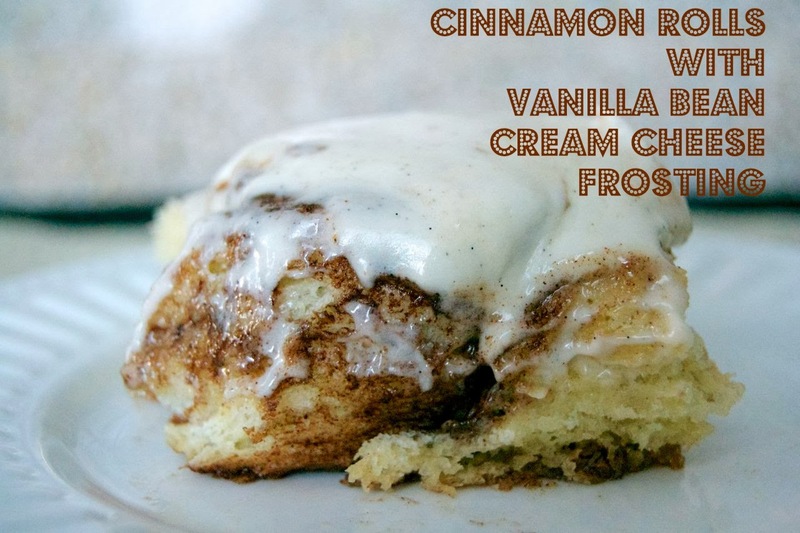 You want these as gooey and as cinnamony as possible. And that freshly grated nutmeg adds an extra special something to your rolls. Use as much or as little of it as you want. And another secret is the vanilla bean seeds in the frosting. 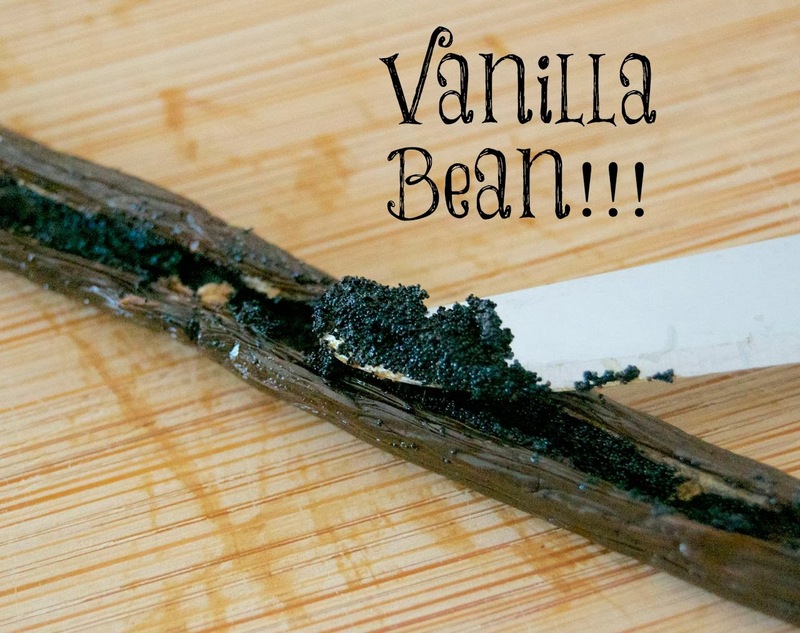 I didn’t just use vanilla extract, I “kicked it up a notch”, taking those yummy little black bits out of that long brown piece of goodness. Looks like caviar, kind of sort of. Ok, maybe not. I’ve personally never had the stuff. This stuff is the black caviar of baking, it is. Add it to the frosting. You won’t be sorry. This frosting recipe was adapted from Simply Savvy Recipes. 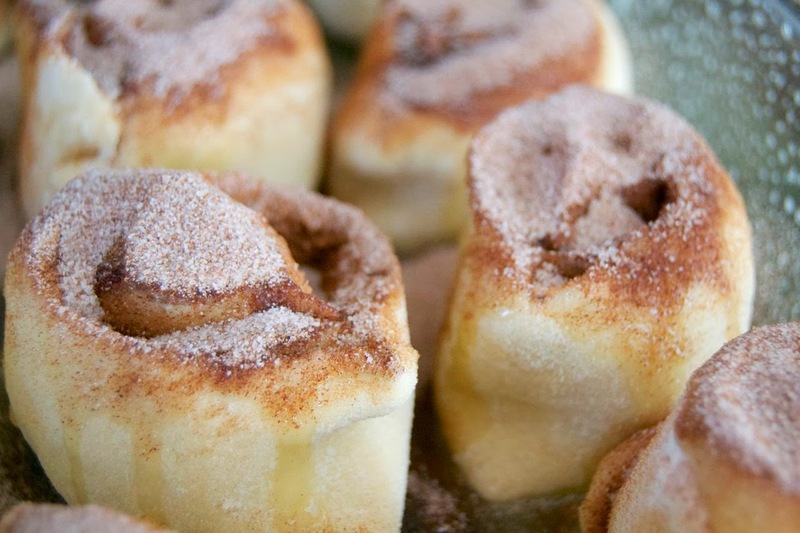 A soft, sweet dough brushed with melted butter, sprinkled with a cinnamon / sugar mixture then rolled, sliced and baked. When removed from the oven, they are spread with a cream cheese frosting flavorfully enhanced with the addition of a vanilla bean. In the bowl of an electric mixer, dissolve yeast in the warm water with the teaspoon of sugar. With the paddle attachment, mix in the milk, remaining 1/2 cup of sugar, and enough flour to make a medium batter. Allow to stand until light and foamy, about 8-10 minutes. Add melted butter, eggs and salt. 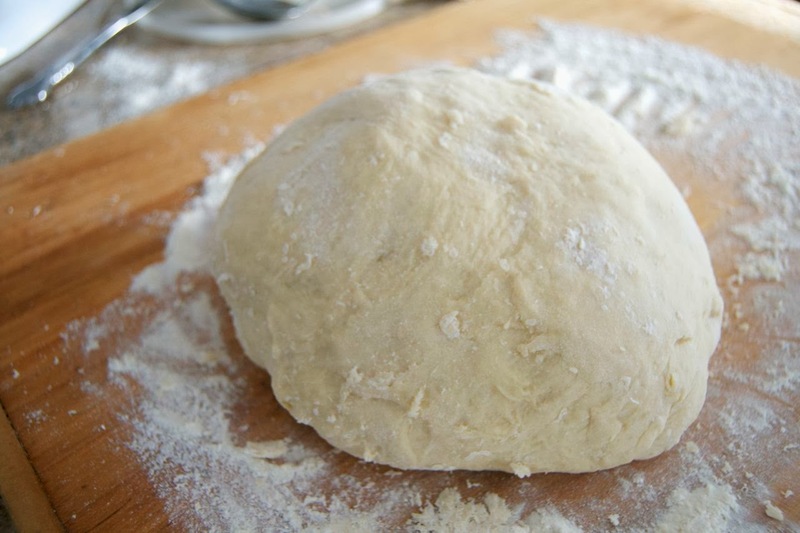 Add enough flour to form a soft dough. Turn dough out onto a lightly floured surface, and allow it to rest for about 10 minutes. While dough is resting, prepare a large bowl by spraying it with cooking spray. Knead dough until it is smooth and satiny. Place into prepared bowl and turn over, coating it with oil. Cover bowl tightly with plastic wrap and set to rise in a warm area until double in size, about 1-1 1/2 hours. On a lightly floured surface and with a lightly floured rolling pin, flatten dough into a rectangle approximately 15 X 20-inches and about 1/4 – 1/2-inch thick. Prepare two 9 X 13-inch baking dishes by spraying them with cooking spray. Spread half of the melted butter evenly onto the dough. Sprinkle half of the sugar/cinnamon mixture evenly. Starting from the long side, gently roll the dough up into one long roll. 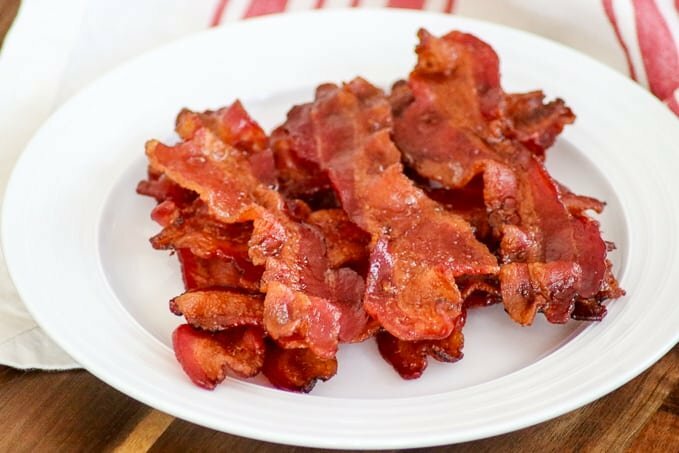 Cut into slices about 1 1/2-inches thick. Place into prepared baking dish, leaving an inch or so between each. Spread some of the melted butter on each roll then sprinkle sugar/cinnamon combo. onto and into the crevices of each roll. Freshly grate some nutmeg over each roll. In a cleaned mixing bowl, combine cream cheese, butter, vanilla extract, and vanilla bean seeds and beat till well combined. Gradually add confectioners’ sugar and thoroughly mix. Repeat with remaining dough, filling and topping. Cover each baking dish with plastic wrap and allow to rise in a warm area until double in size, about 1 hour or so. Preheat oven to 400 degrees F. and bake rolls for 15-17 minutes or until lightly golden. Upon removing rolls from oven, spread with frosting, reserving some to spread when served individually, if desired. Your family will thank you and beg for more. I rate everything I make on a scale of 1-4 with 4 being the best and these Cinnamon Rolls with Vanilla Bean Cream Cheese Frosting earned…yesiree, Bob, 4 rolling pins!! Like I said, both of those 9 X 13-inch dishes filled with this incredibly delicious goodness were gone in about 36 hours. Breakfast calls! 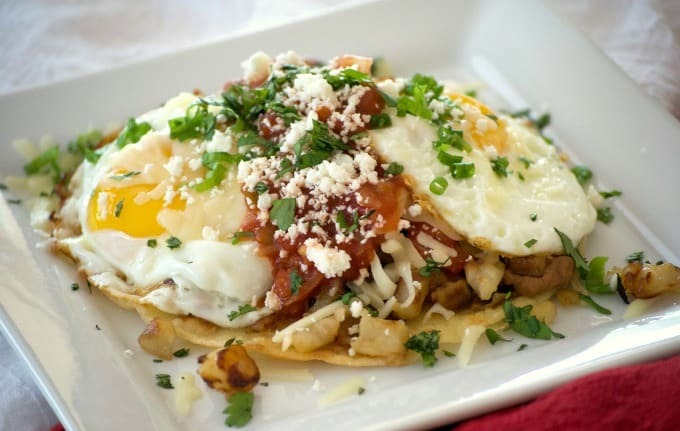 Here are some great recipes to save to your list! 5 people + 24 cinnamon rolls = 1 VERY happy family! Warm right out of the oven on a cold morning here in New Hampshire, this could be a very dangerous recipe for me to make. I would be inclined to have more than one with my cup of tea. Love the Texas Roadhouse rolls, easy recipe, time consuming but worth every delish bite. They are light and fluffy. Next day with left over rolls I sliced them and toasted them for sandwiches. Yummy goodness in every one. recommend every body try this. Next is the cinnamon rolls, dough is the same. Help, my pants are getting tighter, It must be the dryer !!!!!! Can the recipe be frozen before it’s final rise? I’m not sure, but you probably could. I haven’t done that. If you freeze it, please let me know how it goes – I’m interested in hearing about it. I received a Kitchenaid Pro 600 as a retirement gift from my wonderful company. I felt like giving it a trial run today and found your recipe on my Facebook. Even though it was almost 100 degrees today, it gave me a really good place to let the dough rise! My closed SUV! I did everything with the mixer, including the kneading. These turned out better than any I have eaten! Lighter than any bread or roll I have ever made and totally delicious! Made a few changes on the icing ( used vanilla paste and a little half and half to cut down on the richness) I would put these rolls up against any others! Thanks so much for posting! Congratulations on your retirement, Betty! That’s awesome and I’m so glad you enjoyed them so much – thank you!! They’re a favorite here at our house! sorry you’re having trouble. Some of my recipes haven’t been changed over since I moved my site. I’m doing one at a time, but it’s a very slow process with over 600 recipes.